The Voting Dilemma, Voter Turnout and More, Oh My! 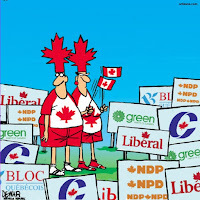 I have been in Canada many years, but only completed my citizenship last summer. Yesterday was my very first chance to vote in a federal election. This became a journey of more than just deciding which party I wanted to lead the country, it became an exploration of the politics involved in casting a vote in the Parliamentary system. Like all political systems, there are strengths and weaknesses. In the U.S. system there is a separation that allows a little more wiggle room. I can vote for a person from different parties at each ballot - House of Representatives, Senate and President. My first conundrum yesterday was that I truly did not respect the local representative from the party I was considering voting for. No matter how hard I tried, I could not justify electing this person as my local rep. This is something I had never faced before and it meant I had to think long and hard about how I should cast my vote. The act became one of strategy. Do I cast a protest vote? 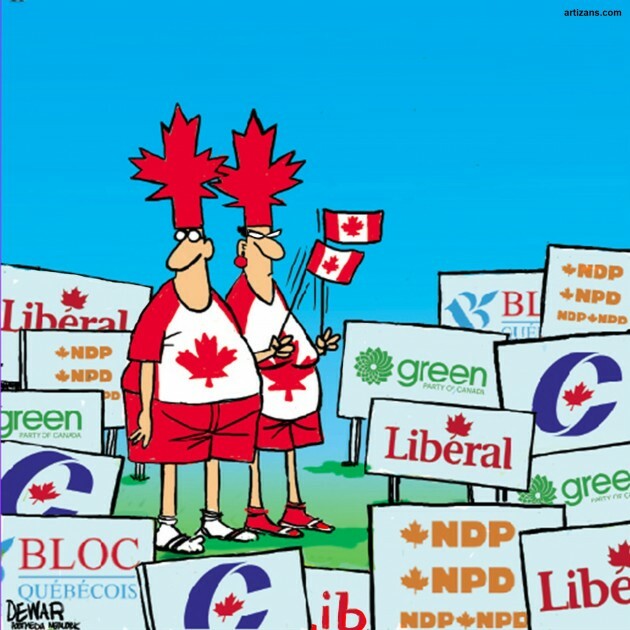 Will my vote for another party with a chance to have seats split the vote in a way that will allow a party I do not want to win? I have to admit, I would have found it easier to cast separate votes for a local rep and for who I wanted to lead the country. I eventually figured out what my best choice was, but it wasn't easy. The second thing I find unusual about the Parliamentary System is that party representatives pretty much have to vote along party lines. If they don't, it's a vote of no confidence and a new election has to be run. No one party can offer a platform that meets the needs of all provinces and all people. It's a benefit in my opinion when your local rep has more freedom to stand up for what his constituents need. 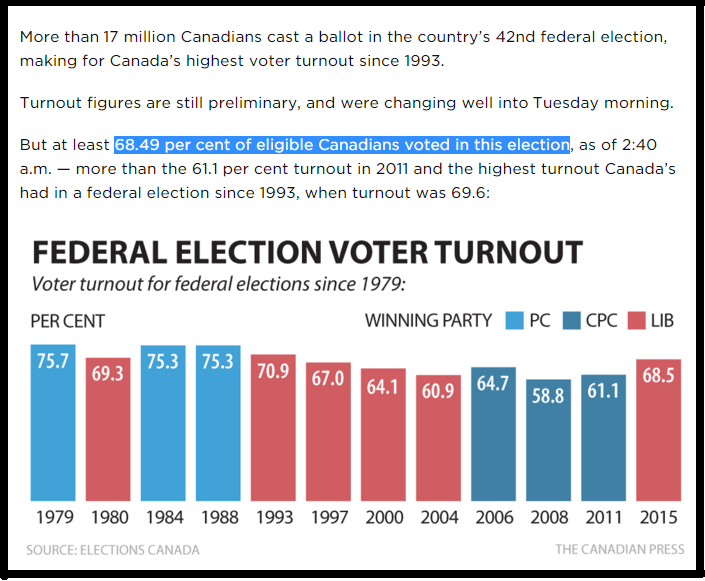 Voting in the both the U.S. and Canada has an issue with turnout. Yesterday we had what the media is calling record numbers casting ballots and it was still under 70%. 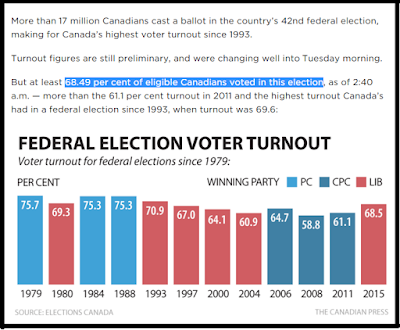 I am happy to have record numbers come out to make their voice heard, but still very disturbed that even with a such a hotly contested election, 30% of Canadian votes didn't bother. WOW! Last night as the election results unfolded, I was reading a book I was sent to write a review on called America Is An Idea and The American Dream is for Everyone by Michael Cyrus Pousti. While I have only just started it and cannot comment yet on whether to recommend it. There seems to be a lot of controversy surrounding his compay. BUT one section had relevance to yesterday's election. In the book the author talks about how if leadership (and company employees) stay the same for a long period of time, there is a complacency that builds in both businesses. The status quo is increasingly embraced and protected - new ideas are looked at with skepticism. The same holds true for countries. One of the strengths of a democratic system is change. There is usually regular shift in who is leading and the local representatives elected. This change shakes things up. It allows for new ideas and new ways of looking at problems to be put on the table. An element of risk is allowed. Yesterday's election brought great change, so it will be interesting to see if this principle holds true over the next few years. For now, the die is cast. Here's to hoping for a strong government that truly represents the needs of our very diverse population.